George Frederick Still 1902 the Lancet, originally uploaded by ADHD CENTER. Sir George Frederick Still (1868-1941) The father of British pediatrics. 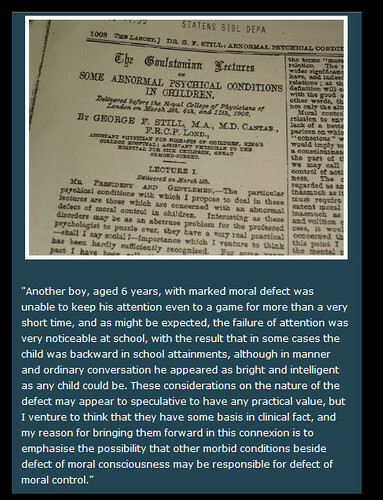 England’s first professor in child medicine presented on 4th, 6th and 11th March 1902 a series of three lectures to the Royal College of Physicians in London, under the name “Goulstonian lectures” on ‘some abnormal psychical conditions in children’, which were published later the same year in the Lancet. He described 43 children who had serious problems with sustained attention and self-regulation, who were often aggressive, defiant, resistant to discipline, excessively emotional or passionate, who showed little inhibitory volition, had serious problems with sustained attention and could not learn from the consequences of their actions; though their intellect was normal. one of the first to describe the nature of ADHD and related disorders.